Obituary – Taylor, Joan Ann « Perry High School Alumni Association, Inc.
Miss Joan Ann Taylor, 22, of 623 Seventh street, was fatally injured in a one-vehicle traffic accident at 12:35 p.m. Thursday in the 6100 block on the North Broadway Extension in Oklahoma City. Services will be at 2 p.m. Monday in the Newton chapel. Officiating will be Rev Don Harnden, pastor of the First Presbyterian church. Burial will be in Grace Hill cemetery under the direction of the Newton funeral home. Miss Taylor had been driving south and alone in a 1969 model Triumph convertible: She had started to exit the Broadway Extension and apparently changed her mind, according to an Oklahoma City police department accident investigation report filed by Patrolman James Keenum and Sgt. Gil Gothard. As the automobile was swerved back to the roadway, it struck a curbing. This resulted in Miss Taylor losing control, the report said. The automobile turned over two times and came to rest on its wheels. Miss Taylor was taken to Baptist Memorial hospital, where she died at 1:15 p.m. Thursday. She was engaged to marry Lt. John Schroeder III, Alexandria, Va. He was reported seriously wounded in action in Vietnam a few days ago. Miss Taylor was born Dec. 30, 1947, in Perry. 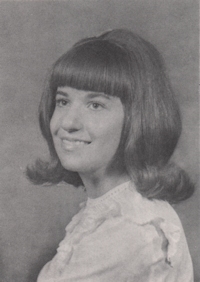 She was graduated from Perry High School in 1966 and received her bachelor’s degree at Oklahoma State University in 1970. She was a member of the Presbyterian Church. Survivors include her parents, Mr. and Mrs. Robert S. Taylor, Perry; one brother, Robert Taylor Jr., Hollywood, Calif.; and maternal grandfather, Samuel Yeager, Kenmore, N.Y.